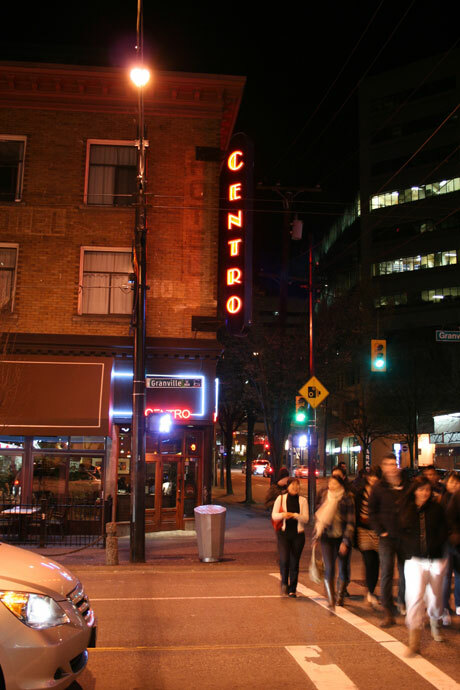 Concert and nightclub-goers are turning on to Centro’s convenient proximity to most of Vancouver’s late night venues. Whether you are attending a Diana Krall concert at The Orpheum or going to shake your bon bon at The Caprice or The Commodore Ballroom, Centro will get you there in style and with time to spare. We’re located within easy walking distance of movie theatres, dance floors and the entire Entertainment District. Centro specializes in late night, Mediterranean style dining. On weekends, you can even stop in for a bite after the show since our kitchen stays open until 1 a.m.
70,835 views. This entry was posted on Saturday, March 15th, 2008 at 10:45 pm	and is filed under Concerts, Entertainment, French, Granville Street, Movie Theatre, Open Late, Patio, People Watching, Restaurant, Trendy, Vancouver City Scenes, Vancouver Restaurants. You can follow any responses to this entry through the RSS 2.0 feed. You can skip to the end and leave a response. Pinging is currently not allowed.